Honda looking northwest. Courtesy Vandenberg Air Force Base. On the morning of 8 September 1923, Destroyer Squadron 11 cleared San Francisco on a high-speed run to San Diego. That evening, as the column of fourteen destroyers closed the entrance to the Santa Barbara Channel in a heavy following sea, flagship Delphy led the formation in a premature course change to port. 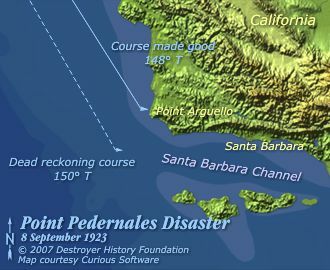 Minutes later, after entering a fog bank that concealed the coast, she stranded at 20 knots on rocky Point Pedernales (locally known as “Honda,” about two miles north of Point Arguello on the grounds of today’s Vandenberg Air Force Base). She was followed in close order by S. P. Lee, Young, Woodbury, Nicholas, Fuller and Chauncey; Farragut, Somers and Kennedy also touched bottom before backing clear. Lockwood and Adamson, Tragedy at Honda. Three shipmates died in the loss of Delphy; twenty in Young, which rolled to starboard before she could be abandoned. Others came ashore that night or the following day, when they were treated by doctors from nearby Lompoc and taken out by the Southern Pacific Railroad, whose tracks ran along the coast at the site. Over the next days, wave action began breaking up the stranded ships, all of which were stricken from the Navy List on 20 November. At a General Court Martial convened on 1 November, Squadron Commander Captain Edward H. Watson and Delphy’s CO LCdr. Donald T. Hunter were found guilty of culpable inefficiency and negligence. Nicholas’s LCdr. Roesch, was also found guilty of negligence but the verdict against him was later set aside. Twenty-three officers and men were recommended for citations by a Board of Inquiry. 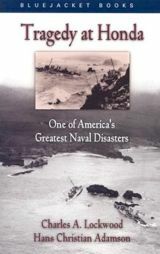 Many more were recommended by Rear Admiral S. E. W. Kittelle, ComDesRons, and while the court martial verdict cost Captain Watson any chance of future promotion, his energetic leadership of rescue operations, acceptance of command responsibility and display of personal character became widely known and admired in and outside the Navy. In 1925, the US Lighthouse Service established a radio beacon at Point Arguello and increased the candlepower of the light there to 900,000 (later 1.3 million). Visit the Point Honda Memorial web site for a timeline, analysis and historical research, including discussion of an earthquake off Japan a week before the disaster and the possibility of unusual currents near Point Honda. Today, web mapping applications identify the site as “destroyer rock” and although its cliffs are off limits due to erosion from the surf, there is a memorial above that once held an anchor recovered from Chauncey and still includes a pair of weathered plaques. Below lie some of Chauncey’s remains. Easier to find is Delphy’s mangled starboard screw, which in 1983 was placed on display outside the Veterans Memorial Building in Lompoc. Sources: Naval History & Heritage Command selected naval documents and Dictionary of American Naval Fighting Ships, Lockwood and Adamson, Tragedy at Honda and Point Honda Memorial.